Handbag size 13.5cm x 13.5cm. Clipboard & Notepad. 1 clipboard with notepad. Sturdy Clip At The Top Which Will Hold All Your Papers In Place. more from range:Jigsaw Puzzle, Pencils, notepads, Stickers, crayons, Maze Puzzle, party bags, Tattoos, gliders, balloons and many more. 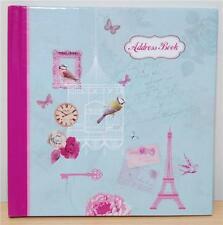 It has a stylish hard cover with a beautiful illustration of love birds surrounded by floral decoration. With ring-bound pages with prompts, a perfect book to keep organised. Ending Soon. We will always help you to have a 100% positive happy buying experience. • Size: 18 x 10 x 1cm. • Paper is 80pp. Finished with a textured hard cover, they also include a tabbed alphabet & bookmark ribbon. I'm Soooooo Organised. Card Organiser. Stay organised and never miss another special occasion with this gold foil finished, contemporary designed card organiser. Spiral bound. 9" x 9" (23 x 23cm) excluding spirals. Cloth covered spiral bound book with spot UV finish. Product size: 160 x 143 x 17 mm. Liberty Of London Phone & Address Book Floral Pattern. 21x16cm. Condition is New. Dispatched with Royal Mail 2nd Class. The crackers I’ve had for years so they are coming apart a bit. Only two have ‘charms’ enclosed. The floral book is hardback and dates from around the 1960s-1970s, the My Weekly book is paperback and probably dates from around the 1980s-1990s. Dispatched with Royal Mail 2nd Class. 7" x 5.5" PADDED A-Z PHONE & ADDRESS BOOK Directory Records Office Index Desk Brand new and sealed. Fantastic quality and build. POCKET SIZE ~ FLORAL DESIGN. WE HAVE A GREAT RANGE OF. WE WILL DO THE REST ! ADD TO YOUR BASKET. A - Z Indexing for easy find. OR FOR A SIMPLE GIFT IDEA. Alphabetical - plus includes an index. Professionally-designed, with plenty of space to read and write. The clear, big type makes it especially easy to use for seniors or the vision-impaired. Paperback: 108 pages. The books would make a great gift for a friend or for yourself! 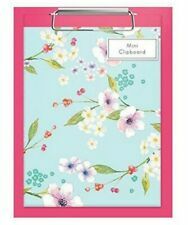 Write down all your thoughts and ideas with this lovely Laura Ashley Lloyd A5 notebook. The outside covers feature a silver background with a black botanical floral print. Inside contains 160 lined pages and a silver ribbon page marker. Bring a quaint touch to your note taking this year. For Arts Sake was founded in 1985 in Sydney, Australia. Finished with glitter and foil, this collection of stationery is the perfect gift or treat for yourself.